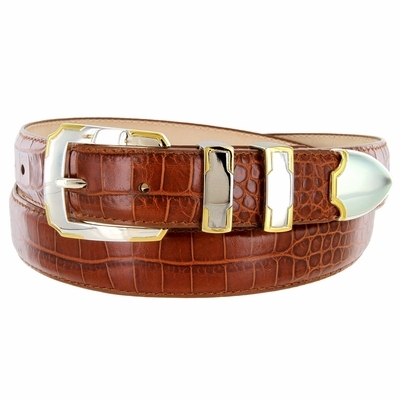 Genuine Italian Calfskin Alligator Embossed Leather Dress Golf Belt. 1-1/8" = 30mm wide Genuine Italian Calfskin. Feathered and Stitched Edges. Snaps for Easy Buckle Change. Stylish Polished Silver and Gold Plated Metal Buckle and Matching Keepers.